This recipe from Strawberry, Fruit, and Vegetables Recipes combines eggplant, basil, and mozzarella cheese to create a filling dish. In a large bowl, beat eggs with milk and spices. Mix in the tomato, eggplant, and basil, and add 1 cup croutons, ¾ cup cheese, and ½ stick butter. Pour mixture into a buttered two-quart casserole dish. Top mixture with the remaining croutons, cheese, and butter. Bake at 350° for approximately 45 minutes until vegetables are soft and the strata is bubbly and browned. Serves 6. People in Willow Springs remember Mary Truelove, the daughter of Italian immigrants, for introducing them to Sicilian cuisine when she retired to the area in 1975. 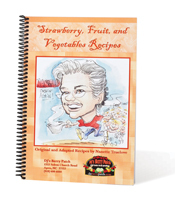 Mary never followed recipes; she taught her daughter, Nanette, to cook the same creative way. Last year, Nanette’s daughter and son-in-law opened DJ’s Berry Patch in Apex, and what began as a way to chronicle the family’s Sicilian recipes turned into Strawberry, Fruit, and Vegetables Recipes. The Italians believe there is a pasta recipe to go along with everything, Nanette says, and the book includes fresh ideas on incorporating such items as cabbage, spring onions, eggplant, and broccoli into easy family meals. Copies are available at DJ’s Berry Patch, 1223 Salem Church Road, Apex, or to order a copy, contact Nanette at (919) 552-3180 or nanettescookbook@gmail.com.